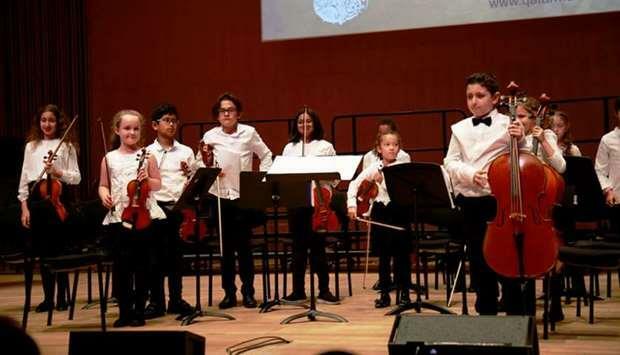 (MENAFN - Gulf Times) It was a gratifying experience for parents as their talented children and well-trained students of Qatar Music Academy (QMA) brought forth thrilling performances during the Annual Student Concert at Qatar National Convention Centre recently. Only a parent can describe the degree of happiness felt while watching their child achieve a milestone or living up to their expectations. The joy of such proud parents was vivid when they cheered for the musical performances carried out by their children. Besides the families of the participating children, there were guests and keen music fans present in the auditorium in large numbers. Before the start of the concert, the young students gave a small performance outside the main auditorium. The students from both the Western Music Department and the Arab Music Department performed with specialised instruments and received huge applause and appreciation from the audience. The annual concert by QMA, a member of Qatar Foundation, included both solo and ensemble performances incorporating both Arabic and Western musical repertoires. The event highlighted QMA's ongoing work, which aims to foster a thriving music culture in the region, supporting QF's mission of developing an understanding of arts and culture in Qatar through music. Talking to Community after the concert, Dr Ozgur Nertesen, Head of Western Music Department, said: 'It was our traditional concert that we do every year. We organised the concert in 2014 for the first time. The goal is to make sure that all our students take the stage and show their progress and hard work that they do during the year. However, we take our youth orchestra. We have very big Qatar Symphonic Youth Orchestra. This year the youth orchestra already had a lot of concerts. So we decided to take our small ensembles and other groups to the concert. In total the participants were over 200. The young musicians were from age six to 18. We had junior choir, middle choir and senior choirs based on the respective ages. Same pattern was followed for the string ensembles. In the end, there was a percussion ensemble. This year we use only our ensembles. 'Talking about the level of the music, this year's concert was the better one. Every single year we get better and better. This is the reason that we actually do this concert. We can see and we can celebrate the progress. At QMA, we have older symphonic orchestra instruments in the Western Music Department. Speaking about QMA, the Turkish music teacher said: 'The students come to us in the evening after their regular schooling. We have a very long waiting list now. We are taking students with auditions but still there are many in the waiting. We currently have almost 500 students. We are planning to change the format of this event, making it more audience-centric. Now we can really prepare the programme that the audience would be ready to pay for. QMA is an eight-year old institute. All the progress that we have made is like a miracle. It comes from the diversity of our students. The children are also experiencing the diversity very early in their education career. I think that is the reason that this academy is growing so fast. Yassine Ayari, Head of Arab Music Department, said: 'There were students from both QMA and Music for All programme. We had more than 50 kids on the stage today. We had the students performing on basic instruments. We had a choir. The pieces we had were a selection of different songs from Arab music heritage, Palestine, Syria, Lebanon, Iraq, Tunisia and Qatar. We tried to have a mix of the Arab music. 'We also had a performance by an adult choir. We had three wonderful performances of Andalusian music. There was a performance of Mushouah music. 'We are trying to bring something new every year. The numbers of our students are growing every year. They have learnt and practiced well how to perform in a group setting. The most important that we are planning to do is to have the Western department performing with Arab department. We are trying to have a collaboration between the two distinct music's.